This #BeakoftheWeek focusses on a member of the Artamidae family. The grey currawong is a large passerine species that is found in southern Australia and Tasmania (Xeno Canto links to a distribution map later in this article). There are 6 distinct subspecies, which are so diverse in their colouration that they were originally split into 6 separate species. They are found in a variety of habitats including arid shrub-land and temperate forests. Little is known about this species, but I will try my best to tell you everything that I have found out about them. These guys spend a lot of their time foraging on the floor, using their strong beak to turn stones and break apart wood, to find tasty morsels. They are omnivorous and their diet is rather varied. They are known to eat fruit and seeds, as well are partaking in the ingestion of lizards, small mammals and birds. Like their close relatives the Australian magpies (Cracticus tibicen) and butcherbirds, they are also fans of predating bird nests. They are similar in size to ravens at about 50cm long, and one of their most distinguishing features, like other currawongs, is their striking yellow eyes. Colouration in birds eyes can be caused by refraction and pigmentation, I like this article which goes into the reasoning and causes of eye colouration in more detail. The female does most of the nest building and all of the incubating, although the male does assist with feeding the young. They usually lay 2-3 eggs, which take about 23 days to hatch. Whilst the female patiently waits for her eggs to hatch, her male companion helps attends to her dietary needs by feeding her on the nest. Once the chicks fledge after around 32 days they stay with their parents until the next breeding season. Currawong calls are pretty cool, and this species has some great ones which can be heard on Xeno Canto. There is an extended version of the above gif here if you fancy watching a bit more chick feeding in action. There is a also a nice video of some chilling out at their local watering hole here. This species is listed as of least concern on the IUCN redlist, and birdlife describes its population numbers as stable, even though they have been described as falling across their range by other sources. BirdLife International 2012. Strepera versicolor. The IUCN Red List of Threatened Species. Version 2014.3. <www.iucnredlist.org>. Downloaded on 27 May 2015. BirdLife International (2015) Species factsheet: Strepera versicolor. Downloaded from http://www.birdlife.org on 27/05/2015. Russell, E. & Rowley, I. (2009). Grey Currawong (Strepera versicolor). In: del Hoyo, J., Elliott, A., Sargatal, J., Christie, D.A. & de Juana, E. (eds.) (2014). Handbook of the Birds of the World Alive. Lynx Edicions, Barcelona. (retrieved from http://www.hbw.com/node/60624 on 27 May 2015). “Image of Strepera versicolor” by Donald Hobern is licensed under CC BY 3.0 . One of our most recent #BeakoftheWeek‘s, the great curassow, is the focus of todays blog. Curassows belong to the family Cracidae alongside the guans and chachalacas, and are the largest members of this group. The cracids are important seed dispersers in the Neotropical forests where the family is found. The great curassow is the largest cracid and can reach lengths of up to one metre from beak to tail. The male is a very striking bird with predominantly black plumage, a curly crest of feathers on his head, white under-tail coverts and a bright yellow knob (or cere) on his bill. The females exist in three colour morphs; a reddy-brown morph with barred tail, a dark morph and a barred morph. All lack the yellow cere of the male. The great curassow is predominantly a frugivore, and perhaps unsurprising due to it’s large size, feeds mainly on fruits that have dropped to the forest floor, such as these guavas. Less frequently, it feeds in low branches and shrubs on attached fruits. It has also been reported to occasionally eat invertebrates and even small vertebrates (e.g amphibians) which are gleaned from the surface of leaves and amongst the leaf litter. It forages for food alone, in pairs or in small groups outside the breeding season, but can form large aggregations when trees such as figs are in fruit. The calls of these birds vary from a low-pitched, deep, booming note to high-pitched peeping notes that are given in alarm. When escaping danger, the great curassow is more likely to run across the forest floor than it is to fly. A monogamous pair bond is considered the norm in great curassows. Both members of the pair contribute to building the nest, which is placed 4-9 metres off the ground and is a platform made from sticks lined with leaves. The female lays 2 white eggs which take around a month to hatch. 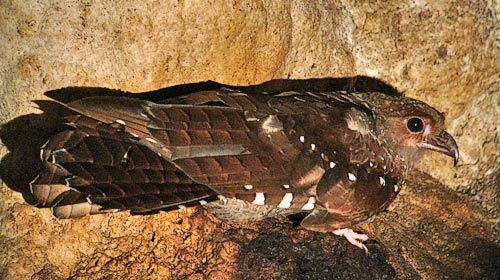 The chicks are buff coloured with black and chestnut markings and are precocial, being mobile soon after hatching. The female may carry chicks away from danger in their first few days of life. Great curassows are long-lived and one female in captivity was recorded to live to 24 years of age. These birds have a wide but fragmented distribution and are found in the dense lowland forests of Southern Mexico, Central America down to Western Colombia and Ecuador. The great curassows’ population has been suspected to have declined rapidly over the past 30 years and was estimated at between 10,000-60,000 individuals in 2009. This species is particularly sensitive to hunting and habitat disturbance from the logging industry and settlement progression, and with population declines predicted to continue, it is listed by the IUCN as vulnerable. A number of conservation schemes are currently in place with more being planned to reverse the population decline of the great curassow. You can find out more about them on BirdLife International’s website. del Hoyo, J. & Kirwan, G.M. (2013). Great Curassow (Crax rubra). In: del Hoyo, J., Elliott, A., Sargatal, J., Christie, D.A. & de Juana, E. (eds.) (2013). Handbook of the Birds of the World Alive. Lynx Edicions, Barcelona. (retrieved from http://www.hbw.com/node/53311 on 27 May 2015). Another #BeakoftheWeek nomination, the keel-billed toucan is under the microscope today. Although not quite as famous as the perennial Guinness mascot, the toco toucan, this species is quite the charmer. 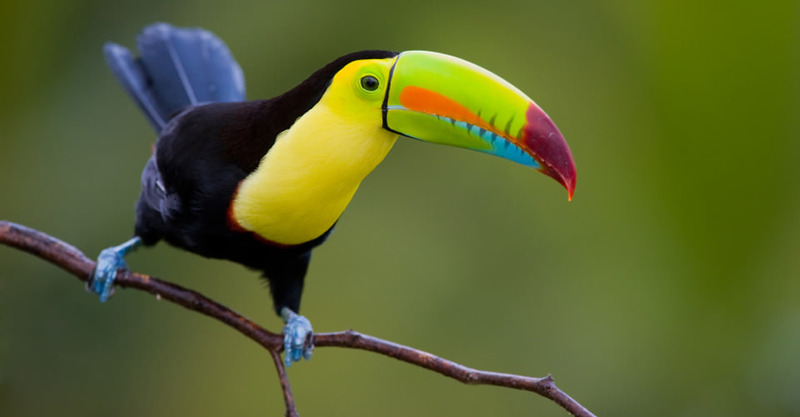 Also known as the rainbow-billed toucan and the sulphur-breasted toucan, it is the national bird of Belize. It ranges from southern Mexico to northern Colombia and north-western Venezuela. They are usually found in pairs or family groups, sometimes in groups as large as 22. Other than its vibrant bill, the keel-billed toucan has a few other things up its sleeve to impress. One of my favourite things, is simply the fact that it has blue feet. They are about 17-22 inches in length, and about 1/3 of this length is accounted for by their impressive bills. Wouldn’t having such a large beak be rather cumbersome you ask? Well… Their beaks are made up of keratin and foamy or sponge-like bone structures, making it light weight, and unlikely to topple them over. Their bills also have the added bonus of being very strong. This article discusses this in further detail. Another benefit to having this large bill is thermoregulation. Toucans are able to use the blood vessels running along their beaks in order to regulate their body temperature. This site has an excellent video of a toucan doing just that. Keel-billed toucans have zygodactyl feet, with two toes facing forward and two back. This interesting piece discusses different toe arrangements in birds, and what they are useful for. This species is known to hang around in large groups, as mentioned earlier, and they also like to play, with reports of individuals tossing berries to each-other. There are quite a few examples on youtube of toucans feeding, which are worth a look at, such as these (1) (2). They are monogamous and both parents are known to take part in incubation duties and feeding their young. The keel-bill feeds largely on fruit, but also consumes arthropods and small vertebrates. This article has been quite video heavy, but there are lots of great ones out there, and here’s a nice one of a male courtship calling. Estimates of their longevity come from captive populations, where they are known to live for at least 15 years and 7 months. In the wild this species is vulnerable when nesting, and they are targeted by snakes, mammals and bird species such as black hawk-eagles. Their population is decreasing due to habitat loss, being taken for the pet trade, and hunting. They are of least concern on the IUCN redlist however, due to their large population size and range. Xeno Canto once again does a great job of showing us where they are found, and what types of calls they make. BirdLife International (2015) Species factsheet: Ramphastos sulfuratus. Downloaded from http://www.birdlife.org on 26/05/2015. BirdLife International 2012. Ramphastos sulfuratus. The IUCN Red List of Threatened Species. Version 2014.3. <www.iucnredlist.org>. Downloaded on 26 May 2015. Short, L.L. & Sharpe, C.J. (2014). Keel-billed Toucan (Ramphastos sulfuratus). In: del Hoyo, J., Elliott, A., Sargatal, J., Christie, D.A. & de Juana, E. (eds.) (2014). Handbook of the Birds of the World Alive. Lynx Edicions, Barcelona. (retrieved from http://www.hbw.com/node/56098 on 26 May 2015). The pileated woodpecker is one of the largest woodpeckers in North America, being about the same size as a crow. It is resident in coniferous, deciduous and mixed woodlands in Canada and the USA (see Xeno Canto link later for distribution map). They are seen as a keystone species, playing a crucial role in forest ecosystems. Amongst other things they excavate holes that can be used by other birds and mammals to nest in, as well as controlling some bug species populations. When you go down to the woods today you may hear the thud thud thud of a woodpecker as it drums on a tree. They are drumming in order to attract mates or advertise their territory. If you or I were to repeatedly bang our head against something we’d get a pretty nasty headache, or even worse, brain damage. The woodpecker is drumming away at a top speed of 6-7 metres a second, with a deceleration of 1000 g, so why don’t woodpeckers suffer the same fate? Fortunately some lovely people have looked into this. The woodpecker’s skull is built in such a way so as to absorb the shock of the impact, something scientists are hoping will allow us to develop technology to help prevention of head injuries in people. Here is a great link that explains this in greater depth. Check out this video to see one of these guys looking for tasty treats. It’d be great to see a slow motion video of the deceleration they experience, but I haven’t managed to track one down. Carpenter ants make up the majority of this species diet, and given the structural damage these ants can do, it is a good job some of them are being taken out of the equation. Pileated woodpecker (right) with downy woodpecker. Pairs in this species defend their territory year round. They could be seen as modern day parents, with the male getting hands on in all aspects of parental care. The males don’t rest on their laurels, after doing most of the nest building, they also help with incubating the eggs, of which there is an average clutch size of four. With the male incubating at night and then sharing the responsibility with the female throughout the day. Feeding duties are also shared between the parents. If you are a fan of cuteness, then this video of some chicks being fed is for you. The chicks are altricial, and leave the nest after about 25-30 days. You’ll be pleased to know that according to the IUCN redlist, this species is of least concern. So, down to the main reason you are reading this blog article. Woody woodpecker’s characteristic laugh is supposed to have originated from this species, I think some artistic licence may have been taken here, but you can almost hear woody himself when listening to these guys on Xeno Canto. If you want to do a comparison, here’s woody after getting up to some mischief. BirdLife International (2015) Species factsheet: Hylatomus pileatus. Downloaded from http://www.birdlife.org on 08/05/2015. Bull, Evelyn L. and Jerome A. Jackson. 2011. Pileated Woodpecker (Dryocopus pileatus), The Birds of North America Online (A. Poole, Ed.). Ithaca: Cornell Lab of Ornithology; Retrieved from the Birds of North America Online: http://bna.birds.cornell.edu/bna/species/148from http://www.birdlife.org on 08/05/2015. The IUCN Red List of Threatened Species. Version 2014.3. <www.iucnredlist.org>. Downloaded on 08 May 2015. Winkler, H. & Christie, D.A. (2002). Pileated Woodpecker (Hylatomus pileatus). In: del Hoyo, J., Elliott, A., Sargatal, J., Christie, D.A. & de Juana, E. (eds.) (2014). Handbook of the Birds of the World Alive. Lynx Edicions, Barcelona. (retrieved from http://www.hbw.com/node/56286 on 8 May 2015). “Pilieated woodpecker” from Freshwater and Marine Image Bank is licensed under Public Domain. The sword-billed hummingbird is the only bird in existence that has a beak that is longer than its body. It is from Andrean South America, ranging from Colombia in the north to Bolivia in the south. At about 13g, which the internet reliably informs me is just over the weight of two bic biros, and 14cm in length, it is one of the larger hummingbird species. This dwarfs the smallest bird species in the world, the bee hummingbird (Mellisuga helenae), which weighs about 2g (not even half a bic!) and is around 5.5cm long. Unfortunately there is little breeding information available for these guys. Here is the gif in video form, in slow mo, to stem your disappointment. This species is typically a nectar feeder, although it also feeds on some insects. Some species of passion flower, such as Passiflora Datura, depend upon this species for pollination. When the hummingbird enters the flower to feed on delicious nectar they get covered in pollen, which they then carry to the next flower, pollinating it. Not just a free-loader. Population size for this species is unknown, but they are listed as of least concern on the IUCN red list. Efforts to preserve this species with ecotourism should help prevent habitat destruction in its range and keep population numbers stable. They are most commonly found 2500-3000m above sea level. Xeno canto once again provides a great distribution map and a few call recordings. BirdLife International 2012. Ensifera ensifera. The IUCN Red List of Threatened Species. Version 2014.3. <www.iucnredlist.org>. Downloaded on 08 May 2015. BirdLife International (2015) Species factsheet: Ensifera ensifera. Downloaded from http://www.birdlife.org on 08/05/2015. Chai, P., Kirwan, G.M. & Boesman, P. (2014). Bee Hummingbird (Mellisuga helenae). In: del Hoyo, J., Elliott, A., Sargatal, J., Christie, D.A. & de Juana, E. (eds.) (2014). Handbook of the Birds of the World Alive. Lynx Edicions, Barcelona. (retrieved fromhttp://www.hbw.com/node/55653 on 8 May 2015). Züchner, T. & Kirwan, G.M. (2015). Sword-billed Hummingbird (Ensifera ensifera). In: del Hoyo, J., Elliott, A., Sargatal, J., Christie, D.A. & de Juana, E. (eds.) (2015). Handbook of the Birds of the World Alive. Lynx Edicions, Barcelona. (retrieved from http://www.hbw.com/node/55570 on 8 May 2015).